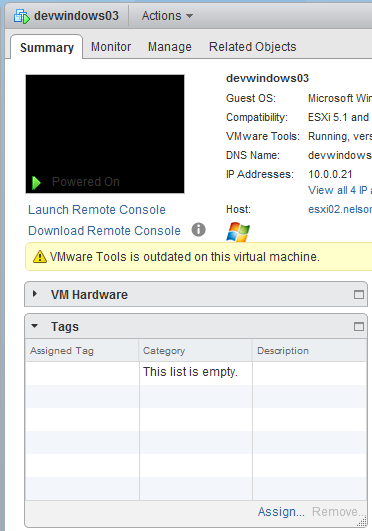 I was recently introduced to some practical usage of vCenter tags. I used tags to build a fairly easy and dynamic set of sources for Veeam backup jobs, but before I get into that, I want to explain tags a little bit for those who are not familiar with them. Tags are something that are pretty easy to understand conceptually. You create a category which contains a few tags. An object can receive one or multiple tags from a given category. 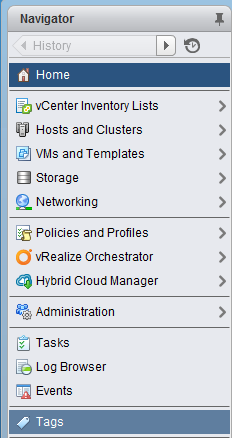 Tags are managed by vCenter, not by vSphere, so require a license that provides vCenter for management. That’s a pretty simple explanation and list of requirements. A Tag Category has a collection of Tags available within it. If the Category is “single cardinality”, it means that an object can only be assigned one tag in the category. This might be good for a category associated with ownership or recovery point objective (RPO). A Category can also be “multiple cardinality”, where a single object can be assigned multiple tags in a category. This would be helpful to associate applications with a VM, or a list of support teams that need notified if there is a planned impact or outage. I’m going to show you how to manage Tags and Tag Categories with PowerCLI (Specifically with the PowerShell ISE and a profile to load PowerCLI), but you can manually create and manage them through the vSphere Web Client, under the Tags item on the left hand menu. You can create and delete and rename tags and categories there all day long, and you can right click on an object almost anywhere else and select Edit Tags to edit the assigned tags on it. When you view most objects, you’ll see an area in the Summary tab labeled Tags that will display and let you manage assignments. Let’s look at how to automate this with PowerCLI. Don’t forget to Connect-VIServer before continuing. 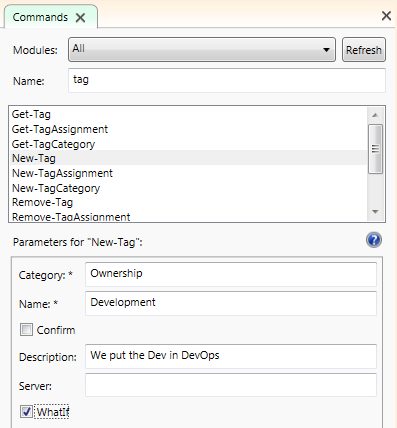 Use the cmdlets *-TagCategory, *-Tag, and *-TagAssignment to manage Categories, Tags, and the assignment of tags to objects, respectively. We start by creating a category using New-TagCategory. This accepts the parameters Name*, Cardinality, Description, EntityType, and Server. A new tag is created with New-Tag, as you’d expect, with parameters Category*, Name*, Description, and Server. Asterisks denote required parameters. Both accept the optional Confirm and WhatIf arguments, the latter of which is extremely helpful while you plan out your tag schemes. New-Tag : 6/27/2016 4:16:02 PM    New-Tag        Could not find TagCategory with name 'Ownership'. You can delete or edit the Tags and Categories using Remove-TagCategory, Remove-Tag, SetTagCategory, and Set-Tag. These cmdlets use mostly the same parameters; use the Command Add-On or Get-Help for more details. You can inspect the Tags and Categories that exist with Get-Tag and Get-TagCategory. 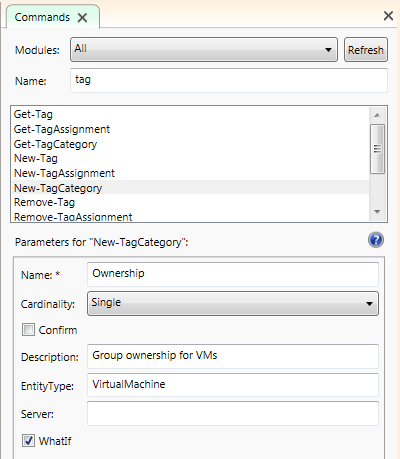 C:\> Set-TagCategory -Category Ownership -Description "Organizational ownership for VMs"
I recommend saving your Tag scripts in version control, so you can recreate or adjust them as needed. Next time, we’ll look at how to assign tags to objects in order to solve a specific problem: backups!